Correction: The original headline for this story read "Fans spend thousands cheering Overwatch League teams - but the money goes to Twitch, not teams." In actuality, the revenue from Cheering on Twitch is shared between Twitch and The Overwatch League, although the split is unknown. We've updated the headline to clearly convey that Cheering supports the partnership between OWL and Twitch, not simply Twitch itself. 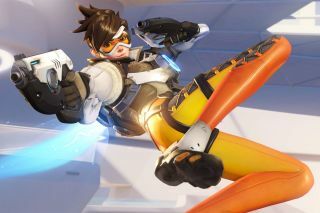 Since Twitch introduced "Cheering" during Overwatch League streams earlier this week, viewers have cheered over 20 million times. Taking a rough conversion rate of $.014 per bit, that equates to around $280,000/£200,000. From February 21, 2018, viewers who have linked their Battle.net accounts to their Twitch, MLG.com or overwatchleague.com accounts can earn in-game currency, League Tokens, by viewing OWL matches. These in turn can be used to purchase Overwatch League team skins. Viewers can also unlock loot by Cheering, too. Cheer on a team with 150+ Bits using a team’s Cheermote, and you’ll receive that team’s exclusive Twitch emote. For every 100 Bits you Cheer, you’ll get one of 26 random Overwatch Hero emotes to use on Twitch, and a promise of "no duplicates" if you want to collect them all. There are also collective milestones to unlock; OWL-skinned Tracer will pop for all eligible viewers when the collective Cheer count hits an eye-watering 40,000,000 bits. The counter on the OWL page now stands at 20,753,559 cheers, with leaderboards offer an insight into who is Cheering the most, and by how much. At the time of writing, Dallas Fuel leads with 3,809,409 team Cheers, while bob7d leads the single leaderboard having clocked up 237,350. The money collated via Cheering doesn't go directly to your favourite teams, though. "Overwatch League Cheering is part of a larger partnership between Twitch and Overwatch League that supports the League and players as a whole," states Twitch’s FAQ (via Unikrn). "Your Cheering helps support this partnership, rather than the teams individually."